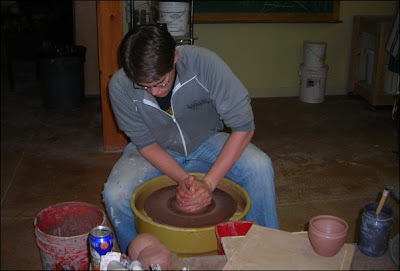 Luke Langholz Pottery: If I haven't been potting, what have I been up to? If I haven't been potting, what have I been up to? Let me give you a solid piece of advice: the next time someone says to you, "Hey! Let's do a puzzle!" TURN. AND RUN. AWAY. UNTIL YOUR LUNGS HAVE EXPLODED AND YOUR LEGS HAVE TURNED TO PUDDING. Krystal and I had a brilliant idea on Monday last fortnight (can you use fortnight as a past tense of time?). Two weeks ago, on Monday night, we were wont for a recreational activity. We were tired of watching movies, we had already played a fiery game of Scrabble, and we were confident in our impending boredom. So we turned to our closet full of board games, linens, toiletries, and cooking products and explored our options. As an aside, we are looking forward to the day when our pantry is not our linen closet, which is not our medicine cabinet, which is not our game drawer. Just as an aside. All those gold ones? They were really annoying. And we tried splitting the blues and purples into piles of dark and light and blue and white and purple and gray, but the fact is that it pretty much gradiated back and forth several times over the length of the puzzle, so that wasn't helpful. At all. It happens to be one of those photomosaic puzzles, where the big picture is made up of millions of tiny pictures related. So this one happens to be Winnie the Pooh floating around the honey tree - remember, that part where he sings "I'm just a little black raincloud, hovering under the honey tree..." - made up of millions of frames from Disney's many Pooh adventures. So not only is it a puzzle in 1,000 pieces, but you think to yourself that the logical course of action is to match the tiny frames up, which is not only not helpful, but it also leaves you blind from staring at these million frames divided amongst 1,000 pieces. So there you go. Masochists: you can buy this puzzle here . Of course, only to discover that we had actually somehow lost one of the pieces to the puzzle. But we finished it. And that's a victory worth celebrating. Which is why, in our infinite wisdom, we bought another puzzle while we were at Target yesterday. We must be a couple of sick people, us. Deeply disturbed. And that's really all I should say about that. So, I made it into the studio this afternoon. I was in sometime midweek as well (glazing, unwrapping some things to dry - did you really want to see pictures of that? ), but this was my first "real" trip into the studio in pretty much two weeks. 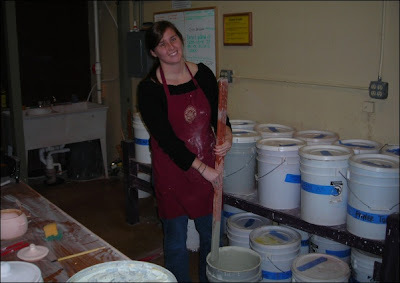 Krystal came along, as she had to glaze a couple things yet from her fall class. She agrees that glazing is the worst part of the process. (and I'm having trouble aligning this picture). As she was there with me, we have a picture of me throwing. She tried to get me to smile, but I hadn't been feeling very productive, so my smile was less than friendly - it looked more like a hungry wolverine than a friendly earth-loving potter - so we'll stick with the action photo that Krystal managed to take while I was throwing something that failed to come about. I think it's a pretty sweet bowl. I hope the commissioner will appreciate it. I hope you all are enjoying your Superbowl Sunday, because I know mine has just been a total peach. I woke up this morning and found myself rocking the Supertones on this Super Sunday, and I recommend you do the same. There is no day the Supertones can't make better, and I recommend you start with their sweet live album . That's it for me - have yourself a grand week!